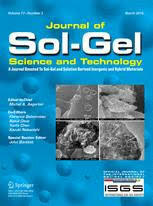 A selection of general interest papers and more specialized ones from the Journal of Sol-Gel Science and Technology, free to read via the links. Structural characterization of bioactive glasses by solid state NMR, Hellmut Eckert, volume 88 issue 2 Pages 263-295. Development of mesoporous sol–gel films for antifingerprint applications on glass, Marie-Eve Druart, I. Recloux, A. Derouaux, C. Van De Van De Weerdt, M.-G. Olivier volume 88 issue 2, Pages 334-344.